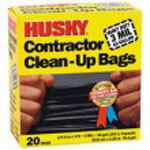 42-Gallon Husky Brand contractor bags. 3-ml thick for heavy-duty use. 20 bags per box.